Marlon Dek started her musical education in her hometown Goes. After her studies at the Royal Conservatory in Ghent with Judith Ermert, she started playing in several classical orchestras such as the Royal Flemish Philharmonic, the Flemish Opera and Casco Phil as a freelance cellist. 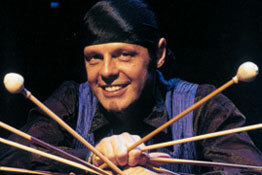 She also performs with dance companies, jazz musicians such as Jef Neve, and various pop groups. Marlon took masterclasses with Ernst Reijseger, Jean-Guihen Queyras, Wen-Sinn Yang, Wolfgang Boettcher, Mischa Maisky, Maria Kliegel and Steven Isserlis. Marlon teaches with enthusiasm at CKB Bergen op Zoom and at the Strijkersacademie, and has several private students. Mari Fujino, born in Ishikawa (Japan), graduated in 1998 from the Tokyo University of Music "TO-HO" under the guidance of Izumi Komoriya, and in 2002 from the Conservatory "GB Martini" in Bologna with full marks, praise and honorable mention under the guidance of Maestro Carlo Mazzoli. In 2003, she graduated from the three-year course of Chamber Music held by the International Piano Academy of Imola under the guidance of Maestro Pier Narciso Masi. She also followed training seminars held by pianists Arnaldo Cohen, Tomislav Bainov, Karl-Heinz Kämmerling, and improved with Maestro Pier Narciso Masi and Maestro Massimo Neri. Mari has been awarded in several national and international competitions, both in solo and chamber music categories, and has worked as a piano accompanist at master classes and music courses led by various renowned teachers. She also lends her work as a pianist for the two-year experimental courses of higher education, held at the state-recognized Musical Institute "Orazio Vecchi" of Modena, and for the improvement courses of the School of Portogruaro, besides her constant collaboration with the Haydn Orchestra of Bolzano. Mari Fujino has an intense concert activity both as a soloist and in various chamber ensembles, as well as in collaboration with various instrumentalists and singers. Naria Kim made her soloist debut performing with the Seoul Philharmonic Orchestra as a winner of the Seoul Philharmonic Orchestra Soloist Audition at the age of twelve. 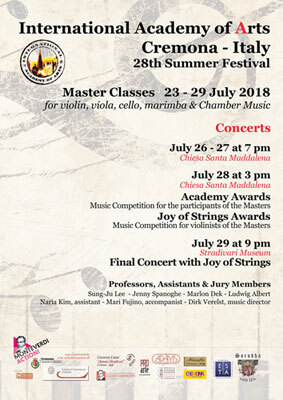 She is a prize winner of numerous national and international competitions including the Kumho Young Artist Audition, the Seoul Philharmonic Orchestra Soloist Audition, the Osaka International Music Competition, the Eurasia International Violin Competition, 1st prize at the Alexander & Buono International String Competition, 1st prize at the CBS national competition, overall grand prize at the Korean artist association competition, 1st prize at the Seoul philharmonic orchestra competition and second prize at the Korea Times Competition. Naria Kim attended the Korea National University of Arts through the early entrance program for gifted students, completing her BM in only three years. She continued her study at the Yale School of Music and is a recent graduate of the SUNY Stony Brook where she studied with Philip Setzer as a DMA student. Recently, she has joined the Chung-Ang University as a faculty member, became a member of the "We Soloists" Chamber group and the JK Ensemble, and is serving as Concertmaster of the New Korea Philharmonic Orchestra. 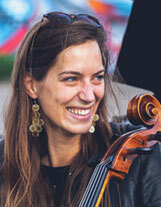 Jenny Spanoghe is known as a Belgian virtuoso soloist, on violin and viola. She is primarius of the Landini string quartet and the Trio Landini piano trio. With Jan Van Landeghem (composer, organ, piano and harpsichord-player), she forms the Landini Duo. Her repertory goes from baroque to contemporary music. She created over 100 compositions, and a lot of composers dedicated their work to her. She is also the protagonist of a new type of instrument, the 5-string viola. 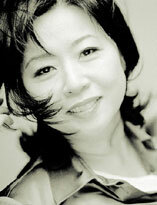 Jenny gives recitals in Belgium and abroad, in which she changes from violin to 5-string viola and to viola. 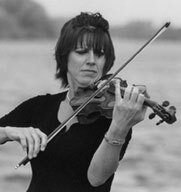 Jenny is professor of violin and chamber music at the Fontys Conservatory at Tilburg (Netherlands). She received a lot of prizes in Belgium and abroad (prize of Sabam, first Prize of Dexia-Brussels and Prize of the French Foundation in Paris). Jenny made about 15 cd's, and is in her free time a painter (canvas on oil) and writes poems in three languages.